Dog training games play a very important role in dog obedience puppy training. And basic dog obedience training is a must for Weimaraner owners who want their dogs to grow up well mannered and disciplined. Weimaraners can be tricky to train. While they are intelligent, they are also strong willed and can get bored easily. So you have to be on your toes when working with your Weimaraner! Weinheimers have been bred to be hunters, so dog training is necessary to make sure that your dog does not become aggressive or overprotective of his “pack” which is also your family. Fortunately, dog training games make learning an enjoyable and exciting activity for both you and your dog. Why Use Dog Training Games? Years ago, dog trainers used harsh methods to train dogs. If you are old enough, you may remember that most dogs were trained by harsh words or even by hitting them when they didn’t do what was expected. 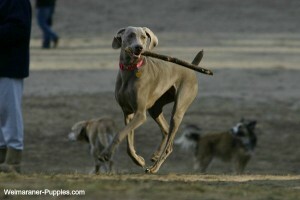 Training games like this game for retrieval, are fun for your Weimaraner! People simply did not understand that dogs could be trained, using gentler methods. But that is no longer the case. More recently, trainers have found that dogs respond much more favorably to positive reinforcement, rather than being yelled at or hit. And they are happier and less likely to become aggressive with family and friends when they are not afraid of their owners. Dog training games have proven to be very effective at training dogs. You get to train your dog, while having fun at the same time. Aside from being good bonding moments for you and your dog, puppy training games help develop your dog’s attentiveness, physical strength and stamina, responsiveness, agility, and even its manners. Playing games with your dog also strengthens the relationship between you and your dog since he knows that you are someone he can trust and have fun with. Dog training games make training and the whole education process simple and easy, so that your dog will not feel pressured and stressed out after each activity. This video with Doggy Dan discusses his philosophy and his gentle approach to dog training. The approach is incredibly easy and effective! Doggy Dan’s videos make training your dog easy and fun, You can access the entire Doggy Dan website, training videos and forum, now for just $1. Just make sure that you praise your dog for being cooperative with you. A Weimaraner will happily live up to your expectations once you are able to convey the message to him. The game of Fetch develops your dog’s knowledge of basic commands such as “sit”, “stay” and “come”, among others. Playing Fetch with your Weimaraner is a way to start getting her ready to hunt with you. Weimaraners are natural retrievers, so your dog should catch on fast to this game. With this game, your dog will learn to follow commands–even though he may not want to… You can use rubber balls or toys and eventually use the Frisbee when going outdoors. This is also a game that is fun for both you and your dog. Have your dog sit until one person has hidden. Take turns hiding while one person stays behind and distracts your dog. When the hider is ready, give the command, “Go find _____.” If necessary, the person who is hiding can make a noise or say something. Another variation of this is to have the hiding person call your dog to “come”. Dog training games make basic dog obedience training easy and exciting for both you and your dog. They make learning fun and informal. When your dog plays dog games with you, he learns commands while having fun. Dogs are eager to please, and having fun with you shows your Weim that you are pleased with his actions. So take some time every day to work with your Weimaraner on commands and tricks. And make sure that you make a game of it!